Use a fork to poke holes into the sweet potatoes. Bake them for about 40 minutes at 370°F or until they’re tender. Once ready, let it cool and cut in half, open and scoop the potato out of the skin. Place the potato in a large bowl and add the nuts and cheese. Stir. Take the empanada dough and add a tablespoon of the mixture to the center and seal. Add enough oil to fry to a deep pan. Add the empanadas when the oil is hot and cook for 5 minutes or until both sides have browned. Once cooked, let rest on paper towels to absorb the excess oil. Mix mayo with your favorite spice salsa to create a tasty empanada dip. Empanadas are one of my favorite snacks and I love making them because they’re so diverse and simple to prepare. 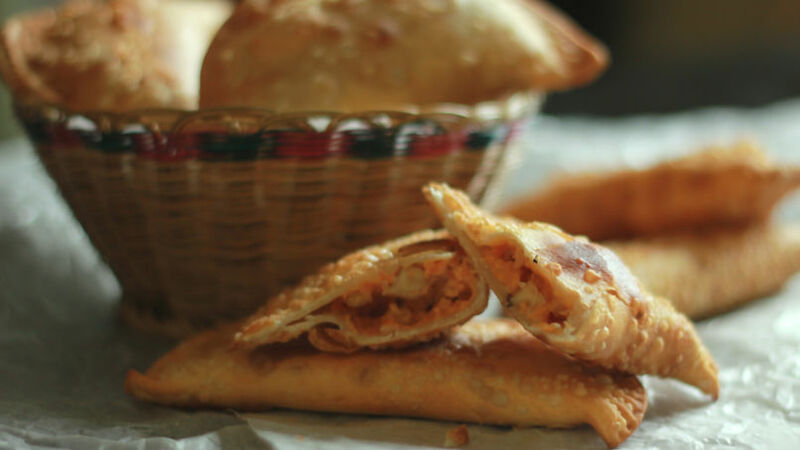 Making delicious empanadas doesn’t need to be complicated; you just need a few ingredients and a great recipe. Now that fall is here, I’ve decided to use a few seasonal ingredients for the filling, including sweet potatoes.